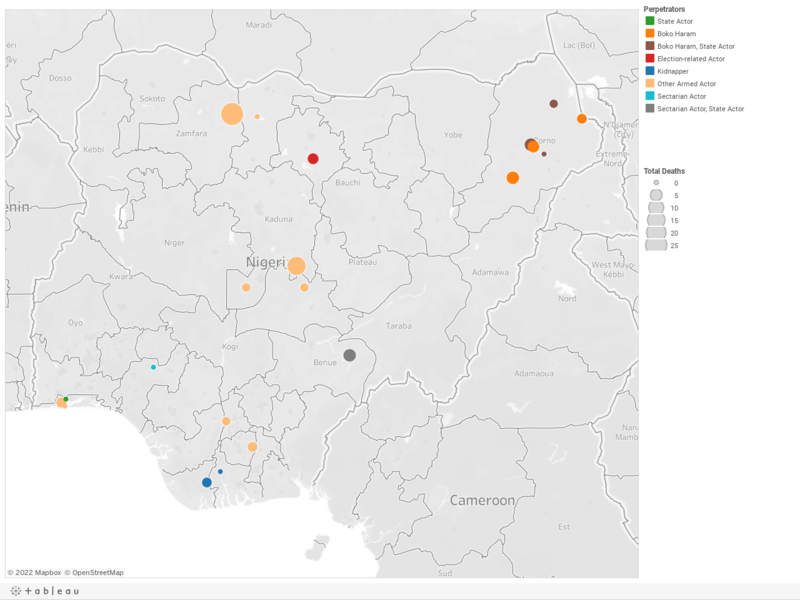 Below is a visualization and description of some of the most significant incidents of political violence in Nigeria from December 15 to 21, 2018. This update also represents violence related to Boko Haram in Cameroon, Chad, and Niger. These incidents will be included in the Nigeria Security Tracker. December 15: Electoral violence resulted in three deaths in Rano, Kano. December 15: Boko Haram killed four farmers in Jere, Borno. December 15: Herdsmen kidnapped eight in Akure North, Ondo. December 15: A Boko Haram landmine killed two soldiers in Ngala, Borno. December 16: Gunmen killed fifteen in Jema'a, Kaduna. December 16: One soldier and four Boko Haram militants were killed during a Boko Haram attack on Maiduguri, Borno. December 17: Boko Haram killed one soldier in Monguno, Borno. December 18: Nigeria's former defense chief was killed and two of his aides were kidnapped in Abuja. December 19: Bandits killed twenty-five in Birnin Magaji/Kiyaw, Zamfara. December 20: Boko Haram killed "some" (estimated at five) soldiers in Damboa, Borno. December 20: Nigerian troops repelled a herdsmen attack and killed "some" (estimated at five) of them in Logo, Benue.